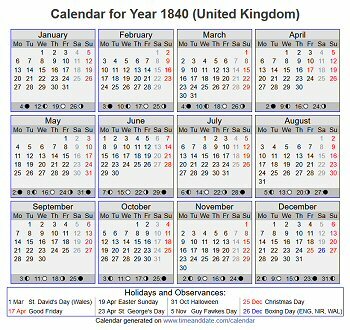 This section contains links to British calendars for each year from 1700 to 2019, including a list of the Bank Holidays for that year, as generated by the excellent site timeanddate.com – often useful when it's necessary to know the day of the week a particular letter was posted! Links will open in a new window or tab. Note that before the change from the Julian to the Gregorian calendar in 1752 the legal start of the year was 25th March (6th April in the new calendar), although the New Year festival was celebrated on 1st January and this was often regarded as the start of the year. This means that there can be some confusion in 17th/18th century dates during the early part of a year as to which year in the modern style is meant. Correspondents would often give both Old Style and New Style dates to avoid such confusion.